Are you interested in becoming an Altar Server?? If you have received your First Holy Communion you can be an altar server at Mass. Sign up is available by calling Richard Waler at 797-3681. It is an extreme privilege to kneel and serve so close to the altar as our loving Savior, Jesus Christ, becomes truly present, body, blood, soul and divinity, at the moment of the consecration. 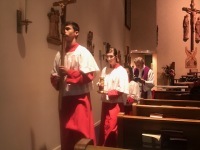 An Altar Server at Corpus Christi can be either a male or female member of the community who assists the priest the Eucharist and other liturgical ceremonies so that the liturgy can be conducted with grace and reverence. Altar Servers should be active and full participants in the celebration with the understanding that they are leaders in the community. The Altar Server models the activity of the community and by singing; praying and keeping silence can enhance the worship of the community. In order to serve at the altar of Corpus Christi, you must have received first confession, Holy Communion and completed the training class for Altar Servers.